Labor Day Weekend 2018 has come and gone, and we at Simpli.fi hope yours was relaxing and fun-filled. Traditionally, many people around the country spend their Labor Day Weekend on or around a lake. This was a great opportunity to capitalize on a major holiday weekend and showcase how our Event Targeting technology could capture local audiences of lake-goers and outdoors enthusiasts. Over the course of the three-day weekend, we setup target fences encompassing three popular regional lakes to see what foot traffic trends we could uncover across commonly used marinas and beaches at various times throughout the day. Our Labor Day Weekend findings were compared to a normal summertime weekend to further look at the increases and decreases in foot traffic. Target fences were setup spanning 9 AM to 9 PM for multiple locations at the following lakes: Lake George, NY; South Lake Tahoe, CA; and Lake Hamilton, AR. Our goal was to see what we could learn about these unique audiences by analyzing foot traffic based on mobile users and how it applied to local preferences, weather conditions, and popular times of day. Check out our findings and insights below, and see how Simpli.fi’s Event Targeting solution can help build a custom audience based around specific interests and hobbies. South Lake Tahoe and Lake Hamilton both saw increases in foot traffic on Labor Day Weekend as opposed to the control weekend (20% and 21%, respectively). Lake George, however, saw a 22% decrease in foot traffic during the Labor Day Weekend. Weather may have played a factor in this, as Monday saw showers and temperatures in the low to mid 60’s. South Lake Tahoe saw beautiful sunny skies, with high temperatures in the upper 70’s. Lake Hamilton saw scattered thunderstorms all three days, but temperatures ranged from the low 70’s to the high 80’s allowing for ample temps for water activities. In terms of hourly trends, we set up morning (9 AM – 1 PM), afternoon (1 PM – 5 PM), and evening (5 PM – 9 PM) fences for each lake to determine popular lake times. 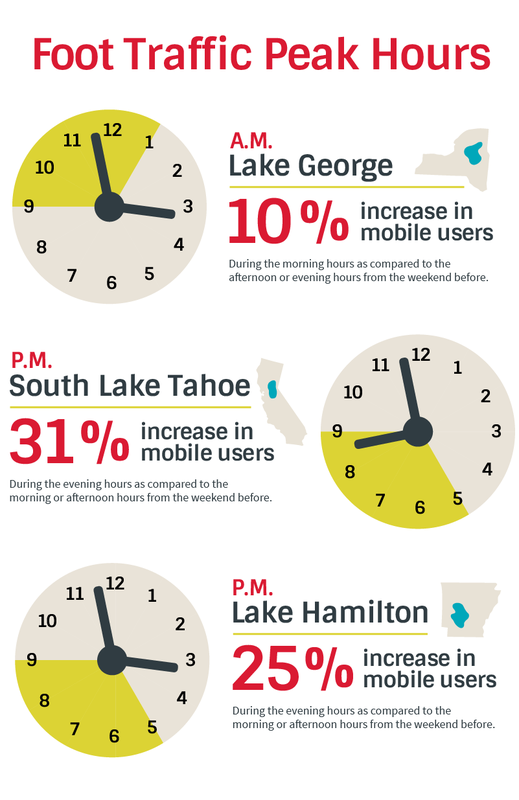 Surprisingly the evening hours stole the show for both South Lake Tahoe and Lake Hamilton, while the morning hours were the most popular on Lake George. Marinas vs. Beaches: What Won the Labor Day Weekend? When comparing foot traffic for each marina and beach locations to one another during the holiday weekend, both South Lake Tahoe and Lake George saw the most activity at their respective beaches across all three days of Labor Day Weekend. This suggests that at both lake locations, relaxing on the shore proved to be a more popular activity than being out on the lake itself. Lake Hamilton saw the most foot traffic at Lake Hamilton Island Marina during the Labor Day Weekend, suggesting that those in Arkansas have a stronger boating culture than those vacationing on Lake George or South Lake Tahoe. All things considered, this exercise provided an informed glimpse into how lake activities and holiday weekend foot traffic vary from state to state – demonstrating just one of the many capabilities of our Geo-Fencing solution. The widespread use of mobile devices and location data is helping marketers stretch their budgets by considering local preferences, nomenclature, and buying habits – helping to better inform their campaign strategy and get the most bang for their marketing buck. With Simpli.fi’s Event Targeting solution, marketers can identify events that align with their goals and employ a localized programmatic platform to build a custom, portable audience and reach people who have already expressed interest in their product or service. For instance, using this example, marketers such as boating companies, rental companies along the lake, and/or popular restaurants within the county can use Event Targeting to capture an audience of lake-goers and target them throughout the summertime and into the year to drive further awareness of the products/services. While we’ll have to wait a year for Labor Day Weekend to roll back around, marketers can utilize our Event Targeting solution right now! Let’s talk! Reach out to your Simpli.fi Account Rep or email us at hi@simpli.fi to learn more.